There's always one movie every year that the big, bad bullies of the internet like to get together and bash. Last year it was Slumdog Millionaire, before that it was Juno, then Little Miss Sunshine. I'll admit to not liking Juno, and making that quite clear. And I do tend to get annoyed when films that don't deserve to be in the final five get overpraised by rabid fans. But the vitriol surrounding this year's Precious: Based on the Novel 'Push' by Sapphire is just beyond the pale. I don't think I have ever seen such hateful, bitter vitriol thrown at a major Oscar contender as I have this one, some of it even seeming personal. And it's completely underserved. No, Precious is not a perfect film. Far from it. I made my issues with it clear in my review. But by no stretch of the imagination does it deserve how it is being treated by the hipster internet elite who try to prove their badassery by shitting on anything it appears the Academy will like. 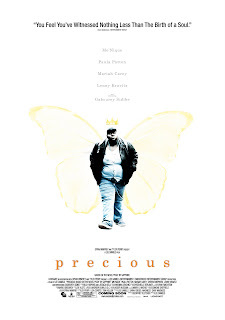 Precious is not one of the best films of the year. It will not be in my top 10, 20, or even 30. But it is not a bad film. But few things make me angrier than the mean-spirited snark you start seeing on the internet around this time of year. The internet seems to breed snark. It's not witty, it's obnoxious, and most people aren't perceptive enough to tell the difference. People think it makes them interesting or cool or funny. But it doesn't, it just makes them look dumb. Just because every keyboard commando in their mother's basement has an outlet to spout their opinion doesn't mean they should. But I guess on the internet they can fool people into believing they're cool and aloof. The biggest problem is that many of these "critics" and bloggers (mostly white) are calling it racist. RACIST! They say it is promoting negative stereotypes of black people. It was directed by a black man, written by a black man, based on a novel by a black woman, nearly its entire cast is black, and its producers are black. If you are white, and you call this movie racist, I can never take anything you say seriously again. You have no right. It's like saying Barack Obama is racist against white people when he's half white. If you want to have an intelligent discussion about the merits of the construction and form of Precious, go right ahead, it deserves it. It's often very poorly directed. But you can't deny the powerful performances, and that hate now seems to be spilling over onto star Mo'Nique, who has publically said she doesn't care about the Oscar. So what? Heaven forbid anyone shake up your insulated little world. Not care about Oscar? The nerve! If you read into my review I suppose you could misunderstood it as some kind of backlash, but I still thought this was a good film, or rather I think it's good that a film like this was made. In any case, I'm not sure how Mo'Nique got into so much trouble. It's unlikely that she'll win Oscar but her performance was without question the best I've seen this year so far, whether lead or supporting, male or female. I actually haven't had a chance to read your review yet but I will get around to it soon. Sorry if you thought I was talking about you. No worries, this is an impassioned defense that just got me thinking of my reaction to the film a month after seeing it; I didn't feel attacked. Count me among those who didn't care for it. I've tried to be reasonable about it, though it's not easy when people are gushing over something and you just don't get it. I haven't seen it since, but I still have fond memories of Little Miss Sunshine. Slumdog was not my favorite film last year, but I still liked it quite a bit. Juno...yeah Juno. I've already said all I need to about that one. That's the hardest part, not liking something that seems inexplicably popular. I was with you on "Juno" so I know what it's like. I can even understand why people don't like PRECIOUS. Lee Daniels makes some very poor directorial choices (the fantasy sequences made me cringe), but for me there was enough that escaped Daniels' heavy hand to redeem it. I didn't care for the film all that much either, and it seems to have lost quite a bit since I initially saw it, perhaps because those drmatic histrionics don't hold any resonance. But believe me, I fully understand where you are coming from, as the backlash against the film has really gotten out of hand. Geez, you'd think it was worse than PLAN NINE FROM OUTER SPACE the way some are talking. I agree Matthew that it wouldn't make a Top 30 for this year, but it ain't terrible at all.